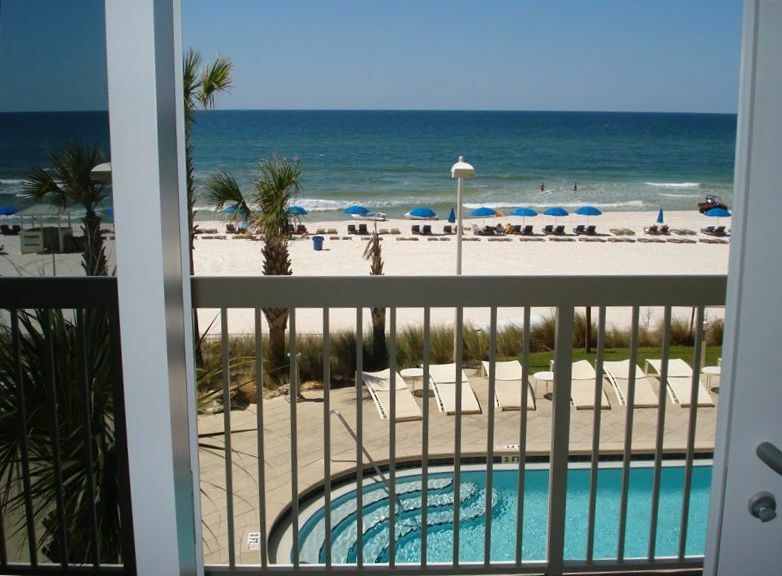 The emerald waters and sugary white sands of PC beach await you at the Calypso Tower Resorts. Upon arrival you will appreciate this beautiful Mediterranean style development and lush landscaping. Come on up to the second floor where you will find a professionally decorated Condo providing you luxurious accommodations for your stay. As you enter the unit, your eyes will immediately be drawn to the spectacular Gulf front view and two 175 foot free forming pools directly on the beach. Let the kids battle over the bunk beds as you settle into your master bedroom with king-size bed, walk-in closet, large bathroom, and your own private access to the Gulf front balcony. The other guest room has a queen bed while the living room has a queen sofa sleeper. Relax in your spacious living room or enjoy your nicely furnished gulf front balcony. If you want to stay in, you will feel at home with our fully equipped kitchen, bar, granite countertops, and wet bar. There are many extras including nine foot ceilings throughout, separate utility room with washer and dryer, and granite in the bathrooms and kitchen. Now it is time to enjoy your 'backyard'. Before you take a dip in one of the pools, stop at the Tiki Bar for a refreshing beverage and snack. A few steps past the Tiki Bar, and you will be sinking your feet into the warm sand and water of the Gulf. The only regret you may have during your stay with us at Calypso will be leaving. But don't worry, we will welcome you back anytime you want to enjoy our little slice of paradise. WE ALSO OWN A 1 BEDROOM/1.5 BATH IN CALYPSO JUST 3 DOORS DOWN FROM THIS UNIT 2-205 LOOK AT VRBO#205060!! 2nd FLOOR IS THE BEST VIEW WE ARE EYE LEVEL TO THE OCEAN AND BEACH! 2ND FLOOR = NO NEED FOR LONG ELEVATOR WAITS! CLOSEST WALK TO PIER PARK! LESS THAN 2 MILES FROM FRANK BROWN PARK BEST LOCATION FOR BALL PLAYERS TO STAY!!!! THIS UNIT HAS THE BEST DEALS AND BEST VIEWS IN ALL OF CALYPSO IF LOCATION IS IMPORTANT TO YOU THAN 2-202 IS FOR YOU!! FREE TO OUR GUEST FREE BEACH SERVICE ENJOY THIS LUXURY!! Keywords: OCEANFRONT, CLOSEST TO PIER PARK, NEXT TO PIER, CLOSE TO FRANK BROWN PARK AND AIRPORT. FREE BEACH SERVICE. Owner of Calypso 2-202, 2-204, 2-205, 2-602 and 2-701. Calypso is across from Pier Park and location is ideal!! If location is important for you than Calypso 2-202 is for you! The resort is oceanfront with exceptional amenities including two 175 foot free-forming pools, Tiki Bar, exercise room and much more. This unit is EYE LEVEL WITH THE OCEAN!! We have the BEST VIEWS on the SECOND FLOOR than any other condo! Watch the sunset views from our spacious balcony! We have FREE BEACH SERVICE FOR OUR GUEST 2 beach lounge chairs with cushions and beach umbrella will be set up every morning on the beach for you! No more dragging chairs and umbrella to the beach! We are on the OCEAN!! Enjoy beach volleyball right in front of the condo. We also have beach toys for the kids! Cordless phones with answering machine in the unit! Free local calls. Best quality 400 count sheets and soft plush towels provided. Full size washer and dryer in a large and separate laundry room. Built in cabinets above full size washer and dryer for lots of exta storage. There is a 15 minute loading and unloading area steps from the unit. Then park across the street in the covered garage. Large refrigerator and freezer with built in ice-maker and filtered water! Cable TV in all bedrooms. PLASMA TV'S!!! Great patio set on the private balcony with comfortable cushions a balcony sofa with two large size chairs and a matching table. 2 large free-forming pools each one is 175 feet! One of the pools is heated to 85 degrees. Tiki Bar between the poools for drinks and snacks! Plenty of chairs around the pools to relax. This is the closest unit to Pier Park!! Walk to Pier Park. Less than 1 mile from the baseball fields! FREE BEACH SERVICE!!! This includes 2 beach lounge chairs with cushions and beach umbrella set up daily for you on the beach. This is a huge savings of $230 per week!! This unit is tiled so no worries about dirty carpets or allergies! We have stayed here for the last several years. We always have a wonderful experience and the owners are always quick to fix any issues (which we rarely have). Thank you for choosing our condos for the last several years! We hope you return soon! We loved this condo! We were impressed with the clean condo and it had everything we needed for our stay. The 2nd floor was perfect with easy access to the beach and pool. We have stayed with Jacqueline before and she is great to rent from. We have already shared info on this condo with people we met at the beach. Thanks again and we will be in touch to rent another week. Excellent condo to stay at!! Our stay was one of the best I've had. The condo was beautifully decorated, clean, plenty of dishes etc. and comfortable beds. It rained a lot but we never let that bother us, they're are just to many other things to do so we beach, and pool it in between raindrops or shop till we drop. Location couldn't have been better. Everyone at the Calypso have always been friendly and helpful, to me it's the best place to stay my first at this condo and I would come back to this one the next time we head to Panama City Beach. Judy I am glad you found this the best condo to say in at Calypso! I agree the location is perfect. I do hope you return soon, we own 7 condos at Calypso. Thanks again, we appreciate you choosing our condo for your stay! Condo was clean, beds were comfortable, close to Pier Park and restaurants. Wonderful staying on the 2nd floor with easy access to the pool and beach using the stairs. Owners were easy to work with and were fast to reply to emails. Can't wait to visit again!!! Thank you for choosing our condo. We are pleased you enjoyed your stay. We also love the 2nd floor :) Thanks Ashley! We enjoyed our visit to PCB. The condo was clean and the location was great for our family. I liked the 2nd floor the views were great and it was easy to get to the pool and the parking garage. We have stayed at a few of Jacqueline's condo and we always have a great experience. Looking forward to next years trip. Thanks for returning our deposit so quickly. Thank you for the lovely comments on our condo. We appreciate having such great renters and hope you return again. We love repeat renters!!! Fantastic condo and great location. Thank you! This is the second time we have rented from Jacqueline and she is great to work with! Both of her condos we have stayed in are clean, nice and just an overall great experience. The beds are comfortable as well we appreciate that. Our deposit was returned quickly and the booking process was easy. Thank you and looking forward to returning a third time now we are retired! Miles thanks for always choosing to stay at our condos. We value having such great renters and appreciate your business. Looking forward to you returning soon! The $300 refundable deposit is due at the time of booking. The rent is due 60 days prior to arrival date. We use pay pal for credit card charges and there is a 3.5% charge of the total charges. We also accept checks too without any additional charges.